Sprouts of mung bean or green gram, Turkish gram and brown lentil are made frequently at my home. Sprouted lentils are considered super foods owing to ready bio availability of minerals and vitamins from them. Although you can't eat enough sprouts in a day to fulfill all your mineral and vitamin requirements. But yes, sprouts are good addition to regular nutritious food always. Pair the sprouts with some nuts and greens and they make nice salads or stir fries. Apart from being fairly rich in calcium, iron, selenium and some vitamins, sprouts are a good way to minimize the phytic acids found in all legumes and grains. Lesser phytic acid means more absorption of nutrients from vegetarian meals. Vegetarian meals have to be very carefully chosen to not load your plate with carbohydrates all the time. Most Indian vegetarians are so used to almost all carb meals that it doesn't even get noticed. Aloo paratha, poori aloo, roti subzi (with very little subzi and more roti), lemon/tomato/tamarind rice or curd etc are mostly carb meals although these are any day better than a chemical laced burger from a fast food chain. But with a dessert after such a meal on a regular basis causes problems sooner or later even if you have a good metabolic rate and lead an active life. It looks a little difficult for vegetarians to include more proteins in their everyday meals, but it's actually pretty simple. We get such huge variety of lentils and beans and we can cook them, sprouts them, roast them in many many ways. Here are a few ways with sprouts. I have sprouted moth (Matki or Turkish gram/lentil), masoor (whole red lentil) and mung here and have let them grow a bit for texture. Note that all these lentils also are quite rich in carbs (6 gm of carbs and 3 gm of proteins in about 100 gm of fresh sprouts) and fiber. Some people find it tough to sprout beans but it is an easy process. I have written about making sprouts at home earlier too and would add one more thing here, that the sprouts keep well if refrigerated after sprouting as much as you wish. Just take care to rinse well before refrigeration, they stay more crisp in the fridge. Also, if you want longer sprouts (the tails or the radical), just keep them longer at room temperature. If you want thicker and whiter sprouts keep them in a closed opaque container so light is not available during sprouting. It takes about 48-50 hours to make nice long and white sprouts in summer temperatures in India. If you partially expose the sprouting lentils to light, they look greener and thinner (as seen above) and have more nutrient value. Here I used red amaranth leaves fresh from the garden and made it into a complete meal for myself. Along with a nice creamy buttermilk on the side. Heat the oil and tip in the dry red chilies and chopped ginger. Let them fry for 30 seconds and then add the sliced onions. Add salt and fry the onions till soft. Add the chopped amaranth greens, add the pepper and cook for about 5 minutes or till it gets completely limp and looks glazed. Take off the flame, add the sprouts, mix well and adjust seasoning. Add lime juice to taste and serve warm as a meal or as a side dish. I like the fresh crisp of the sprouts and a lightly criminalized sweetness of onions along with the greens. Lime juice will not be required if the amaranth greens are fresh so have it as you like it. You can even use spinach or fenugreek greens for this stir fry. I make another soupy type meal for myself in a hurry sometimes, using sprouts. I like kadhi a lot, especially when I want a warm liquid type meal for dinner. This one cooks in about ten minutes and tastes way better than instant noodles. Healthier definitely as you see.. I just whip 2 tbsp of besan (chickpea flour) in a cup of buttermilk or thinned yogurt, along with 2 pinches of turmeric powder and salt to taste. Add a cup of water more to it and cook this liquid in a sauce pan or kadhai for about 10 minutes. Stirring initially once or twice till it starts simmering on it's own. It has a tendency to boil over, so be careful in the beginning. 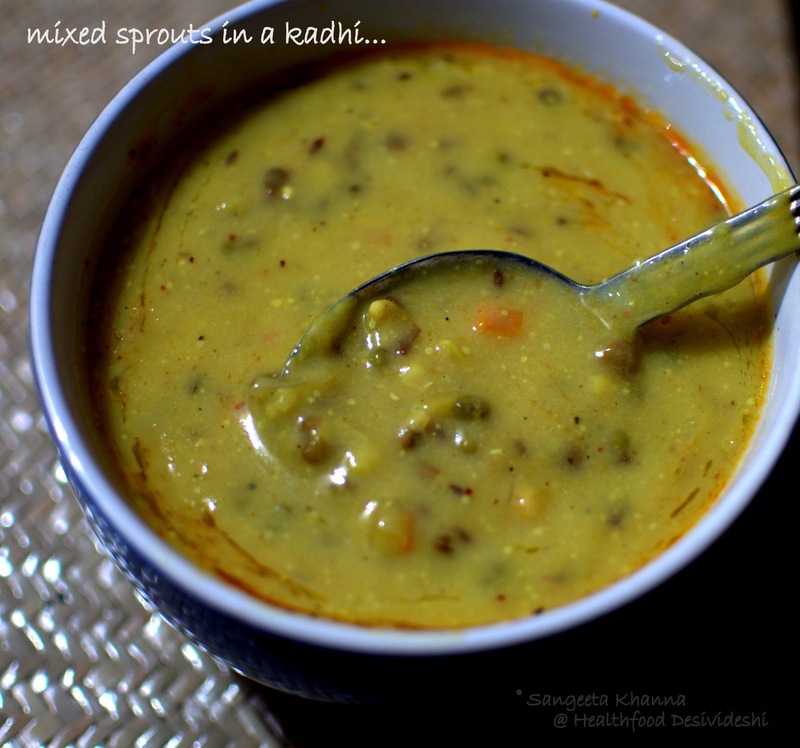 The kadhi is cooked once it is saucy, add the sprouts and take it off the stove. Make a tempering with 1 tsp ghee, hing and red chilly powder to taste, a bit of garam masala can be added too. Add the hot tempering into the cooked kadhi. mix well and enjoy a hot meal. I add a few chopped bits of carrots or onions in it sometimes, especially if I have some leftover on the kitchen platform. This is comfort food for me. Some diced cucumbers, carrots, mint and coriander greens are added as and when suitable. This salad is a great snack when you are enjoying a chitchat sitting with a friend on a couch together. Serve some lime tea or lemongrass green tea with this and you would want the chitchat to go on and on. It beats the chips/wafers and kurkure hands down. What all do you do with the sprouts? I add them to my tahiris (rice pulav with vegetables) sometimes. Delicious recipes Sangeeta! 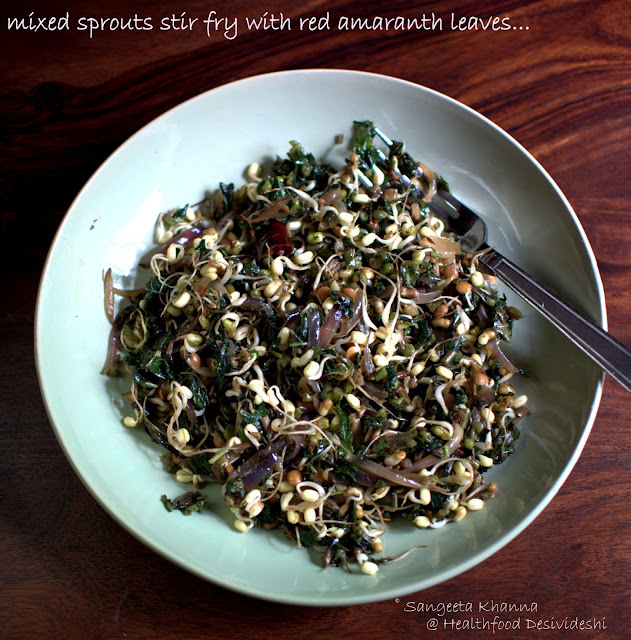 I love sprouts and make sure we have them twice a week.. either as a salad or a dry bhaji called usal. 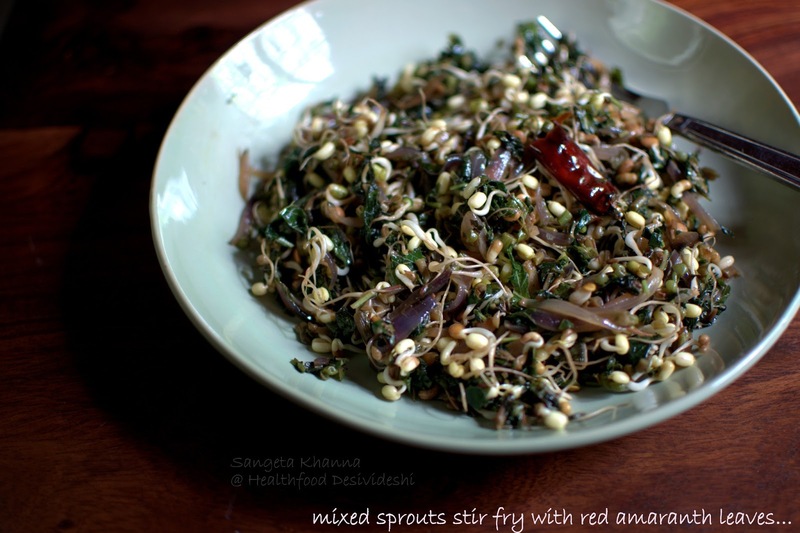 Today I've made a Mangalorean delicacy called ambat with moong sprouts, its a favourite at home :) will give you the recipe if you like! I love the way you think food. It's helping me think healthier all the time. Off to soak some sprouts. feeling good already! Just in time! I was looking for some sprout recipes. Would try them soon. I love to use sprouts instead of dal in dry khichdis, basically just like your tahiri. Have you ever made the Maharashtrian dish usal? That is also a good one. Actually I like to add sprouts everywhere. They are even good added to upma! Or you could make upma but use sprouts instead of the sooji, I do that sometimes for a healthy breakfast. Sprouts are even the basis of the number one healthiest year round street snack in Allahabad - sprouted kala chana mixed with onion, cucumber, tomato, chillies, chat masala, etc. Sometimes other sprouts are added too. By the way, do you use the pulse kulthi (horsegram)? This pulse is very good for the body, especially kidneys (very good in diabetes too). Although it is available here in UP, I don't think many households use it a lot. 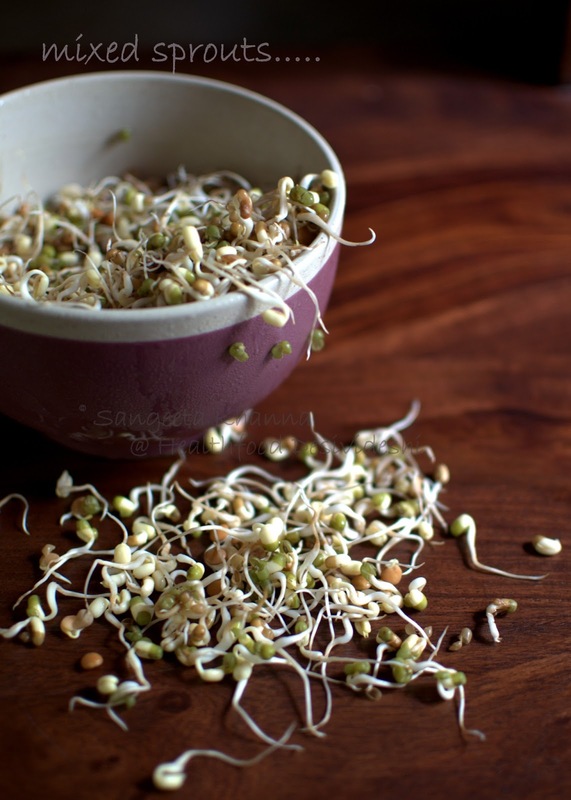 I do though - you can sprout it and use it any way you use sprouts (I love a tahiri made from it) or you can use it whole and make all sorts of broths and stirfries with it like they do in Konkan region. I have also made salads and chutneys from it. Such a healthy pulse, we should all use it more I think. Yes I use kulthi Jenni. I have posted a dosa in the past and a few more recipes probably. I like it cooked the way we cook sabut masoor with some garam masala too. That tip about the opaque container is genius. Just one question-how long do I need to keep them in the sun the next time for greener ones? Also do I alternate sunlight with shade or something? Keeping the sprouts in the sun will cause appearance of leaves in it Torsha. Keep then in a place where there is ambient light. Just that. I made a load of them,nice and long. Have some lovely amaranth at home so yes will be doing the first stir fry. 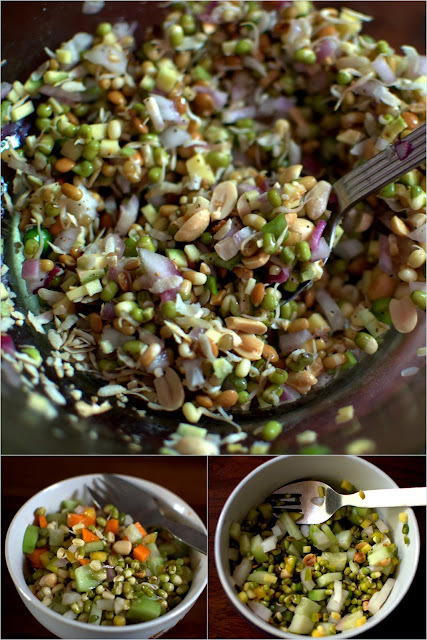 I love using moong sprouts along with potato for my pani puri filling that I make at home. I also enjoy the aloo tamatar sprouts gravy that goes beautifully with rotis. One can make pesarattu with moong sprouts as well. Also, I keep throwing it in most sookhi sabzis. It goes rather well and blends. Of course, totally love it in Chinese gravies. You can make misal too!